Bluestem has their date wrong and cannot get their teams here for the 4/18 game with transportation issues. This one is out of our control, but the varsity softball and baseball games against Bluestem scheduled for today have been canceled. No rescheduled date has been set. Our bus #1 was unfortunately rear ended, but all kids are safe and accounted for. 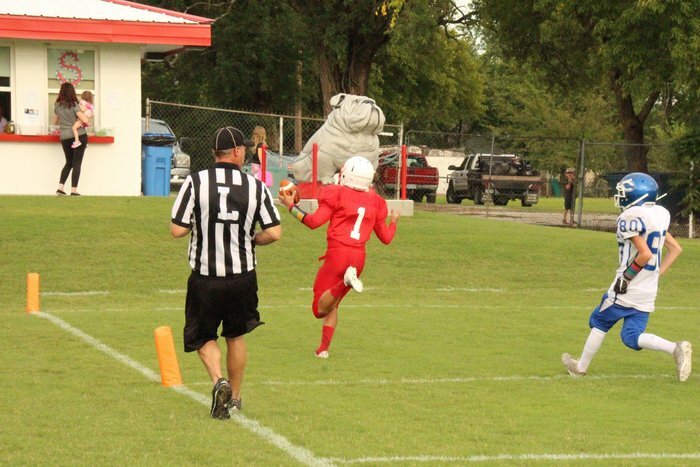 No major injuries at this time for the Bullpup Family to report. Please send your thoughts and prayers to the other vehicle involved in this accident. Lincoln reminder: If you would like your 3rd grader to have a school sack lunch for their upcoming field trip to Elk City (4/26/19) please make sure they have their lunch form turned in by tomorrow 4/18/2019. We have extra forms here in the office if needed. Just a reminder that as of today students will no longer be allowed to make a negative charge on their meal accounts here at CVHS. 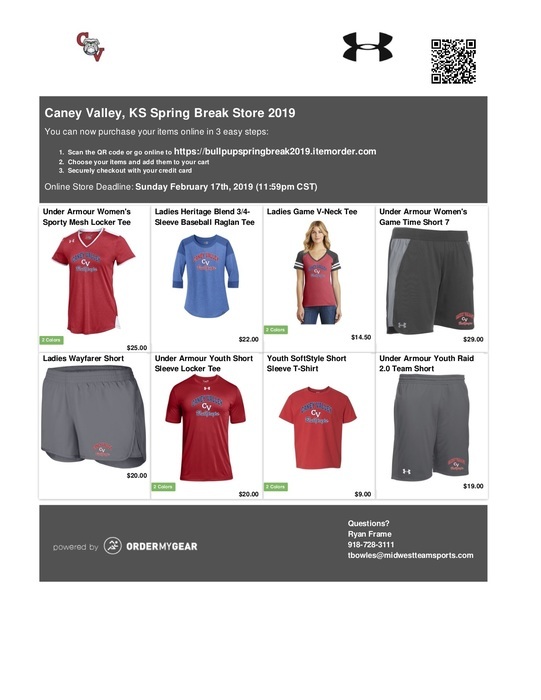 We received an email from Jostens today letting us know they will open and email another opportunity to purchase a CVHS yearbook. 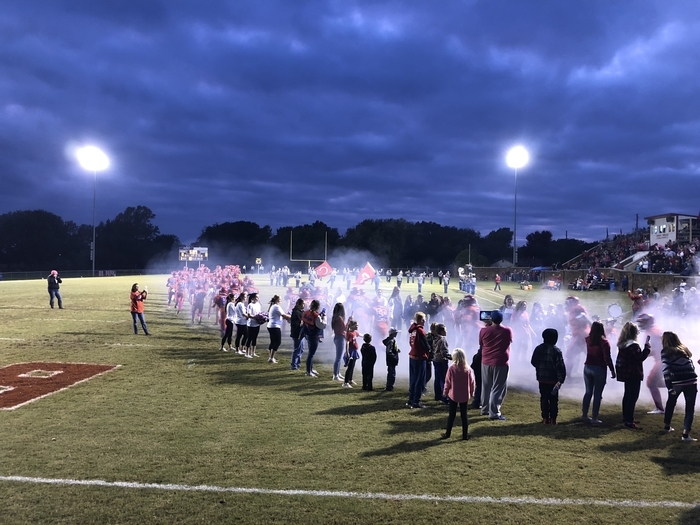 They will email parents later this month with more information, but you CAN still purchase a yearbook now and what looks like the rest of this month. The auditorium doors will open at 6:30 for prom walk-in. Please be patient with us as we do our best to accommodate for the weather. CVHS Prom 2019 Due to the high probability of rain, as well as construction issues, please follow this procedure. Parents, family and friends please park in the east parking lot. You will need to enter at the outside door to the Band room. From there, proceed to the Auditorium. Students will line up and parade on the stage for pictures, then go on to the gym for prom. Students, you will drive to the back of the ag shop and enter the building at outside auditorium door by the greenhouse. Umbrellas will be available at vehicle drop off. *Please note friends and family attending the walk in can not enter the high school beyond the auditorium. Lincoln reminder: According to our meal policy as stated in our handbook, students will not be permitted to charge meals during the last 6 weeks of school. As of Monday, April 8th, we will not allow any charges to your child's meal account. All meals MUST be pre-paid. Thanks! 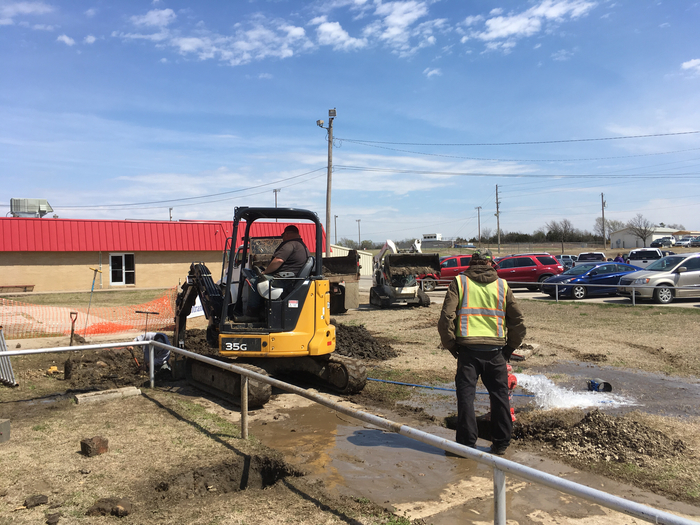 Thank you to the city of Caney for your help in repairing the fire line at the school! Lucky to live in a community with so many people willing to lend a hand when needed! Have a great Friday and weekend Bullpups! The home varsity softball games vs. Eureka on 4/4 have been postponed to 4/5 at 4:30. The scheduled JV softball games vs. Erie on 4/5 have been canceled. The scheduled JV baseball games vs. Erie on 4/5 WILL still be played. This morning Bus #11 slid off a backroad on Rd 30 near Niotaze. All parents have been contacted & seen by a nurse. We are glad to report no major injuries at this time. 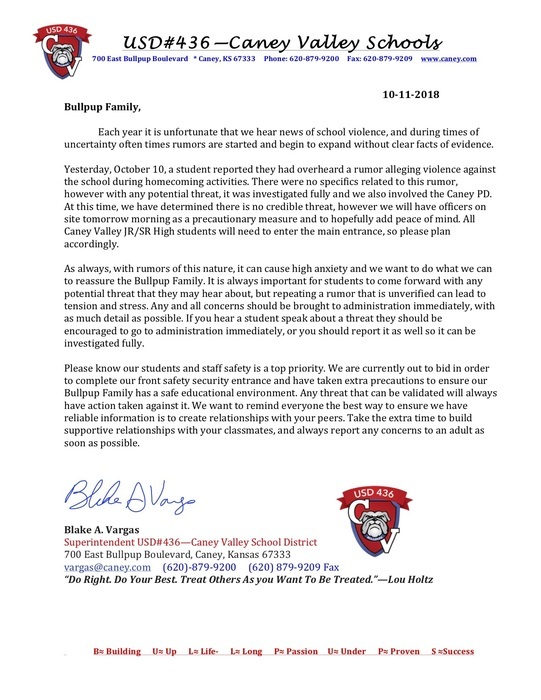 The safety of our students remain a top priority, we appreciate your continued support of our Bullpup Family. The Bullpup Booster meeting will be Wednesday, April 3rd at 6:30 pm in the Cafeteria. The After Prom meeting will follow at 7pm. 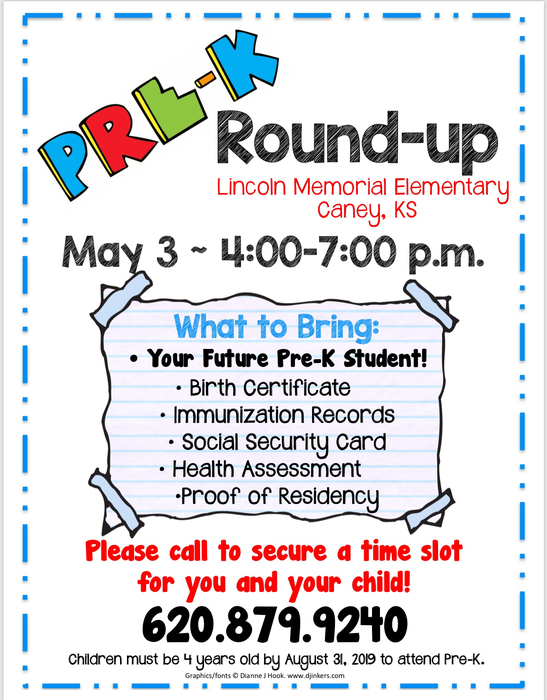 Lincoln reminder: Pre-K and Kindergarten music concert tonight starting at 7pm in the grade school gym. Please have your student here by 6:50. Lincoln reminder: There will be a Booster meeting tonight at 6:30 at the grade school cafeteria. Everyone is welcome to attend! 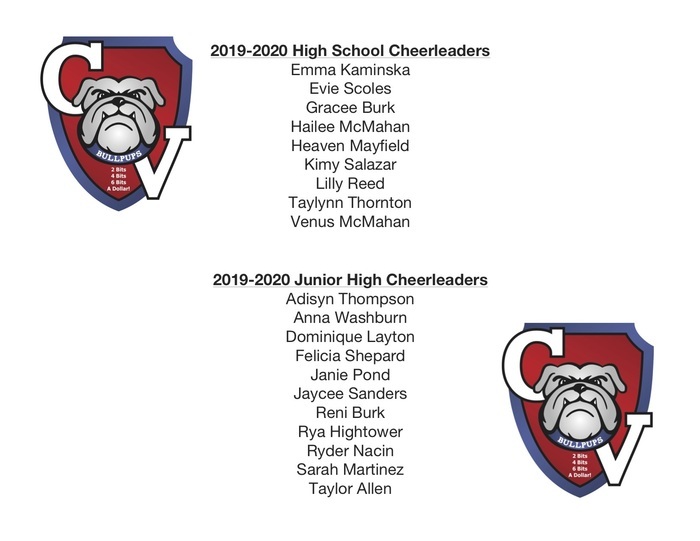 Congratulations to all those who made the 2019-2020 Cheer Squad! Thank you to all who all participated. 2 Bits, 4 Bits, 6 Bits, a Dollar! The JV baseball double header at Cherryvale today (3/29) has been canceled. 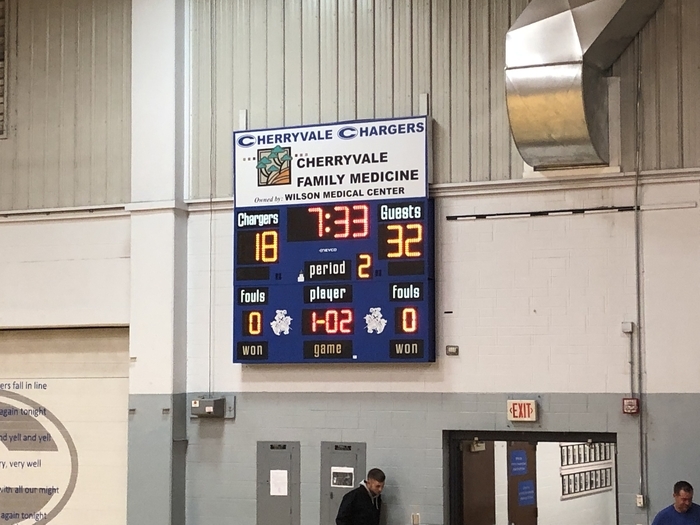 There will be NO JV baseball games at Cherryvale today. The winter sports banquet that was scheduled for Tuesday, April 2nd has been cancelled due to numerous scheduling conflicts. We will be doing the winter and spring banquet together this year on Wednesday, May 1st at 6:30 pm. 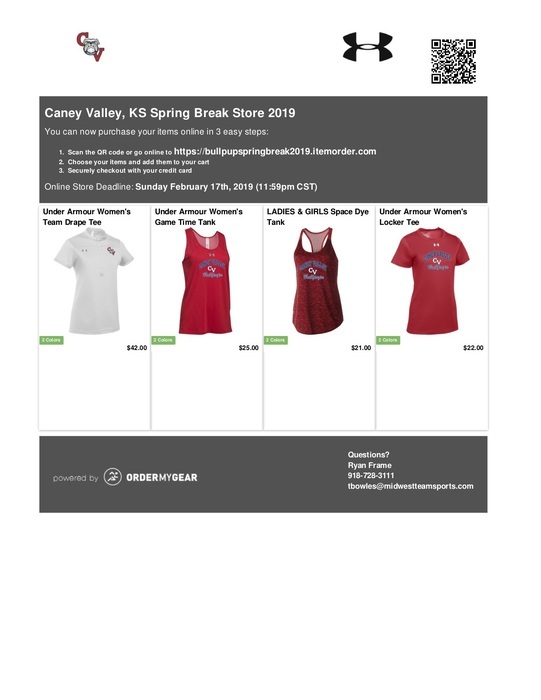 Anyone that had sent on their reservations and money, can get their money refunded at the CVHS office from Robbin Richey or they can leave it there for the banquet on May 1st. 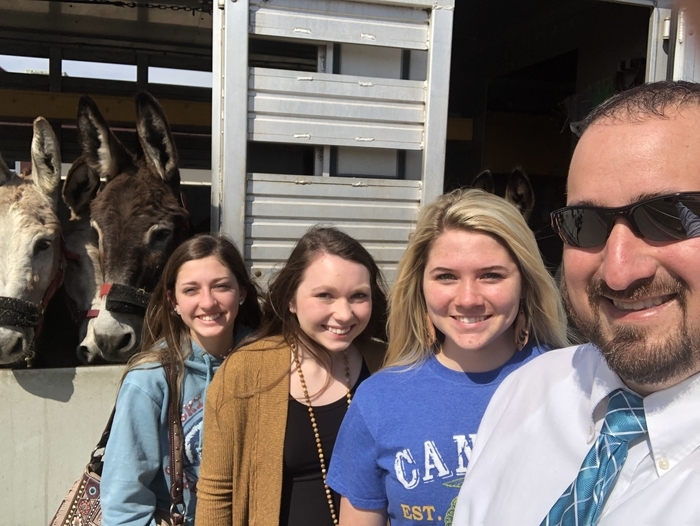 Don’t forget Donkey Basketball tonight 7:00-8:30! Lincoln reminder: Reading Counts and Student of the Month assembly is this Friday, 3/29, beginning at 2:35. Everyone is welcome to attend! 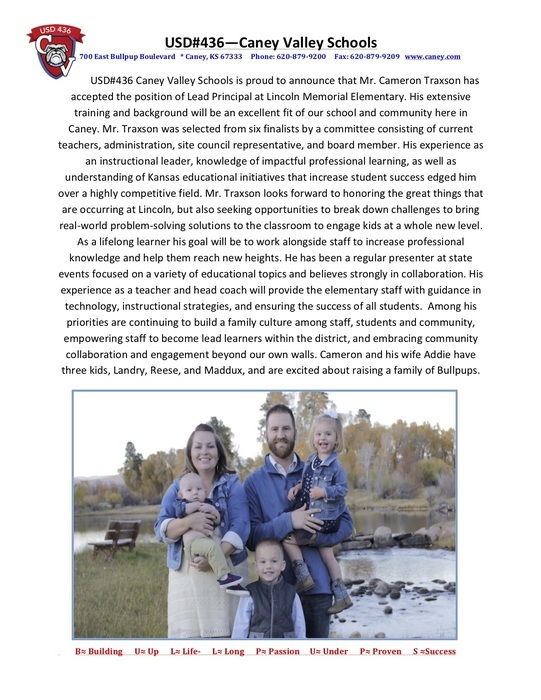 What better way to start the weekend than for us to announce and extend a welcome to the newest member of our Bullpup Family, Mr. Cameron Traxson who will be joining us as the new Lincoln Memorial Principal. 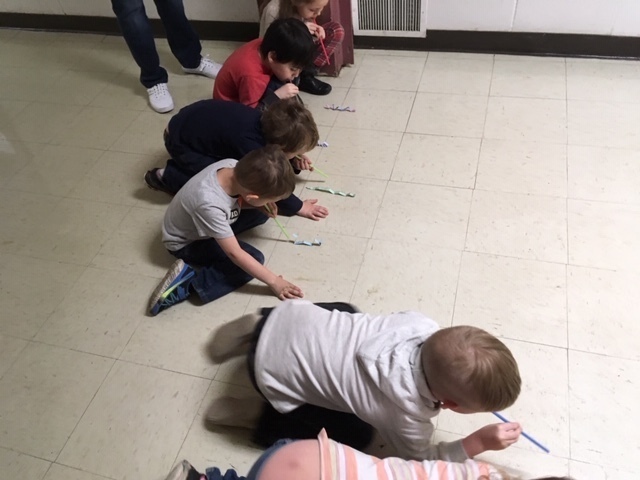 Fun at Lincoln with a Pre-School "snake" race!! March 26 and 27 the 7th grade, 8th grade and 10th grade students will be taking state assessments. Please help your student get lots of rest and a good breakfast. We are shooting for 100% participation with out having to have make-ups. It’s required that all students in those grades are tested. JH and HS cheerleading tryout practices begin on Tuesday, March 26, all interested in trying out for the 2019-2020 cheer seasons need to meet in the cafeteria at 6:00 pm. This is a practice to prepare for the actual tryouts, held on Friday, March 29! Forms are in the main office. There will be no tutoring today or tomorrow for Lincoln students due to parent teacher conferences. Junior High and High School parent teacher conferences are tonight from 4-7 p.m. and on Thursday from 4-8 p.m.
Lincoln parent teacher conferences are this Wednesday 4-8 and Thursday 4-7. If you have not scheduled a time to meet with your child's teacher please do so ASAP. 5th and 6th parents (only) must pick up grade cards in main office and then meet with teachers. (without appt.) If you have questions, please call us here in the office. 879-9240. Last Family Fitness Night for Lincoln will be tomorrow, Tuesday March, 5th from 6 to 7pm in the grade school gym. Everyone is welcome to attend! Seniors, if you DON’T buy a yearbook by the morning of Friday, March 1 it will not be possible to have your name stamped on your yearbook. Yearbooks are $50, check payable to CVHS. No second chances! Books can be ordered after today, but will not be personalized. Reminder for Lincoln: Spring and class pictures tomorrow, March, 1st! 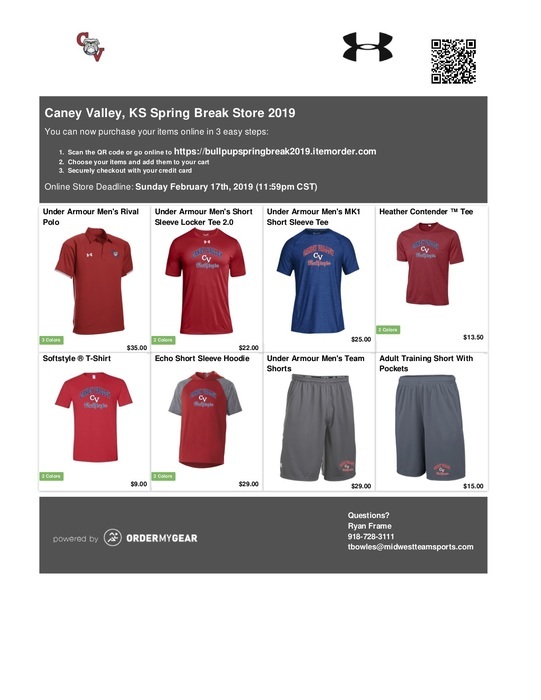 Please have your order forms in no later than tomorrow morning. Junior High After School Activities have been cancelled for today! URGENT UPDATE! 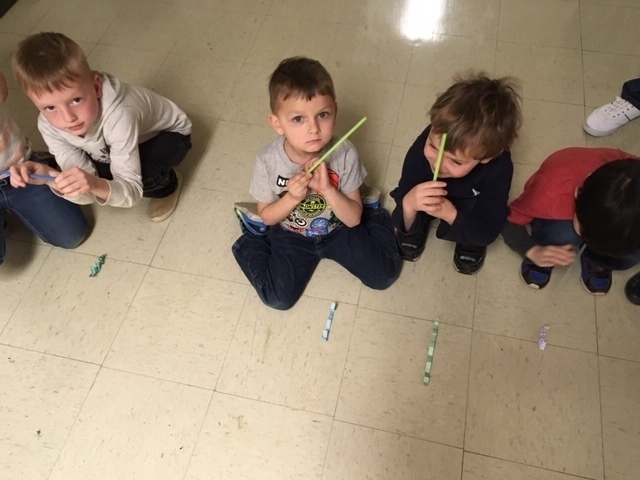 - FRIDAY March 1st 2019 EARLY DISMISSAL - Afternoon PreK will all attend the AM session and dismiss at 11:15. Lincoln is dismissed at 1:00 and Caney Valley Jr/Sr High is dismissed at 1:15 with bus routes to transport immediately following dismissal. There will be no after school tutoring for Lincoln students today, 2/27, due to weather. 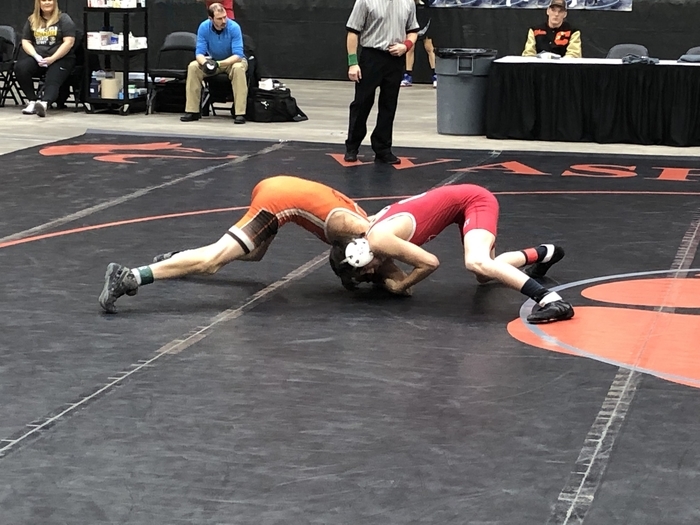 Jake finished the 4A state tournament 2-2. Congrats Jake! Read Across America is next week at Lincoln Elementary! 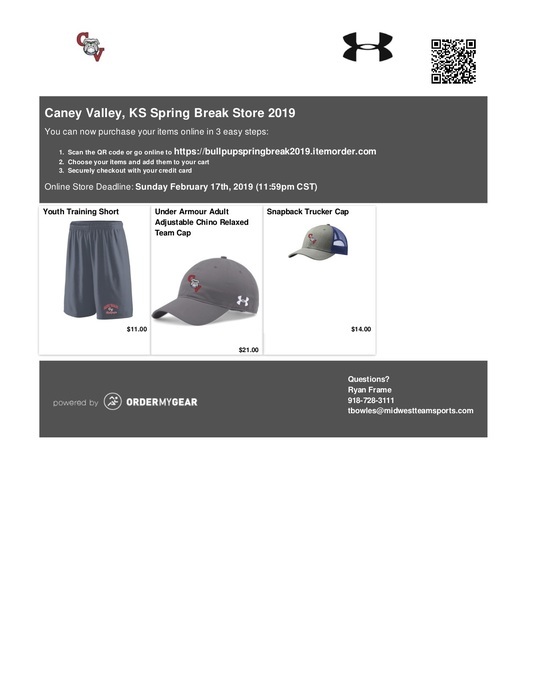 Monday 2/25 wear a vacation or college shirt. Tues 2/26 wear animal print or clothing with animals on it. Wed 2/27 wear Christmas clothes. Thur 2/28 wear PJ's. Fri 3/1 wear your CRAZY socks! Looking forward to a fun week! 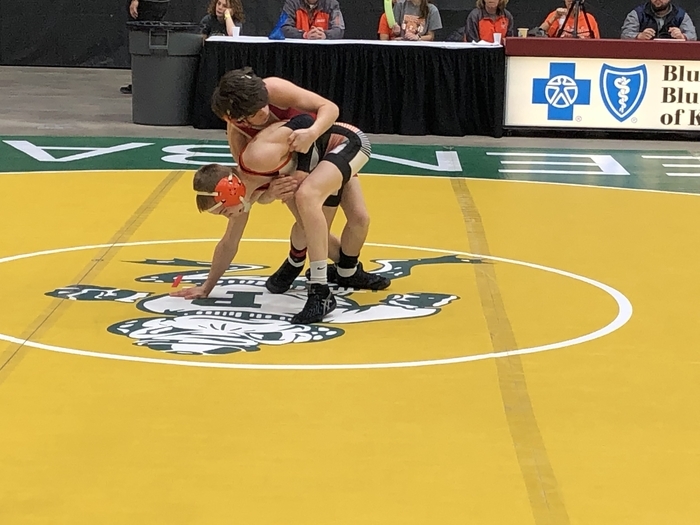 State Wrestling begins at 10:00 am on Friday, February 22 and continues on Saturday, February 23 starting at 9:00 am. 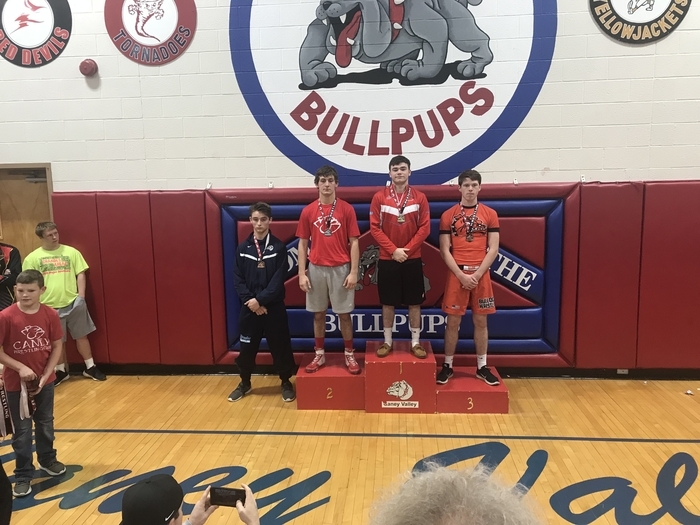 Jake Stanton placed second at the Regional Tournament earning his place to compete at the State Tournament. Congratulations and good luck Jake! 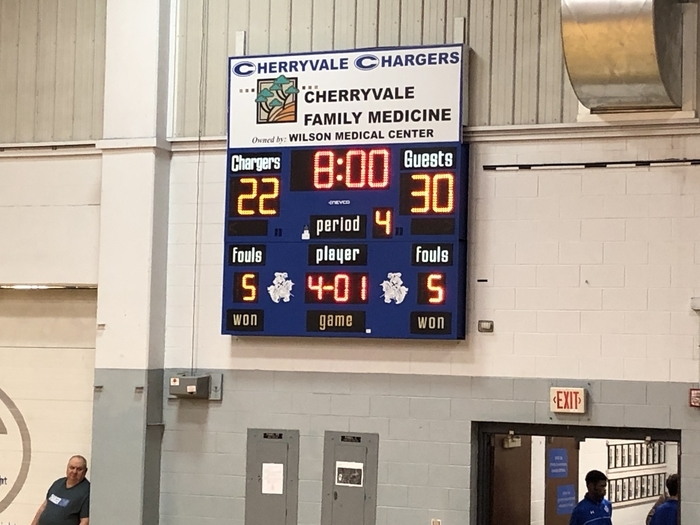 The girls are a 4 seed and play at Cherryvale on Monday, February 25 at 7:00 pm. The boys are a 3 seed and host Columbus at 7:00 pm on Tuesday, February 26. 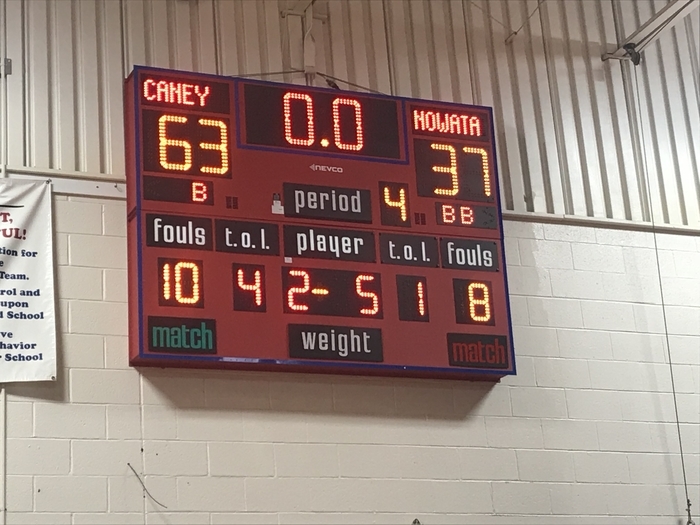 All remaining games will then be played at Caney on February 28, March 1-2. 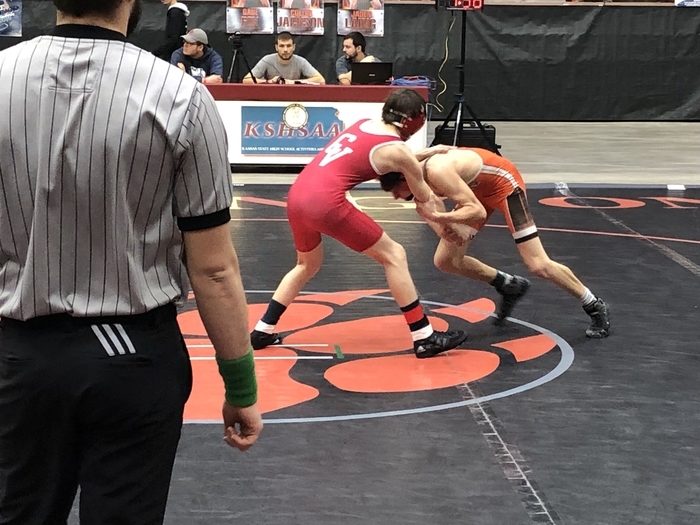 Sub-state brackets are also posted on KSHSAA. School will be in session today, Wednesday Feb. 20th. 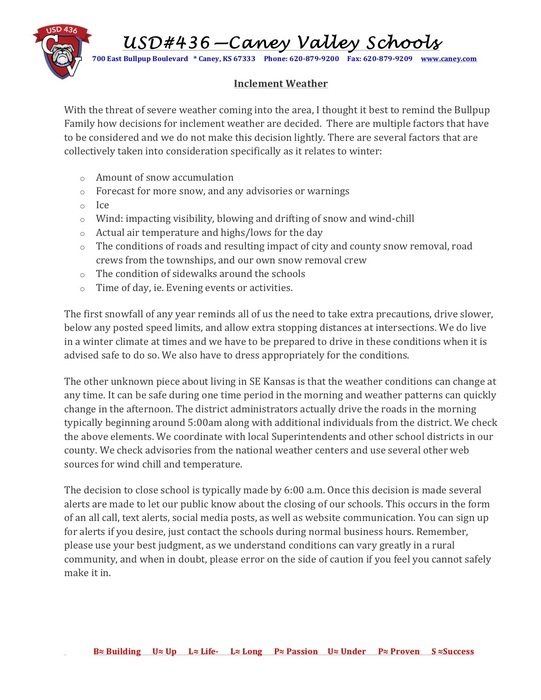 As always use your best judgment when sending students out, take extra precautions, and be safe. See you soon Bullpups!! Reminder for all band and choir: Pizza kits will be available to pick tomorrow, February, 20th by 4:30 in the high school band room. The Lincoln Student of the Month/Reading Counts Assembly has been postponed to Thursday, February 28th at 2:35 pm in the grade school gym. Basketball games for tonight Tuesday, Feb. 19th will be moved up one hour due to incoming weather. 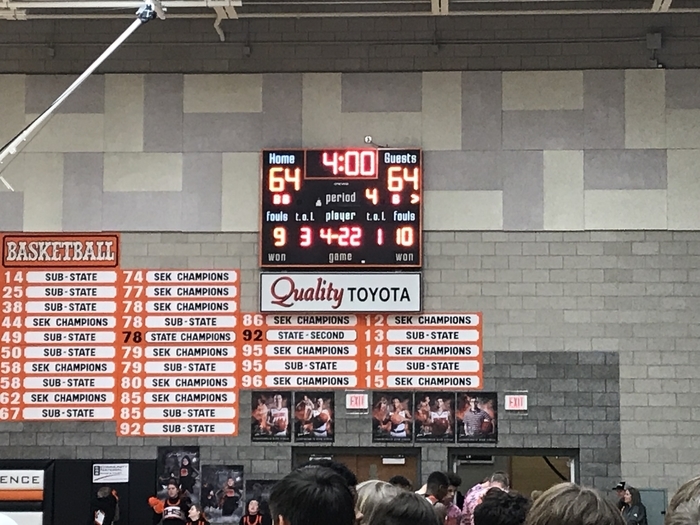 Varsity girls will now play at 5:00 with Varsity boys game to follow immediately. 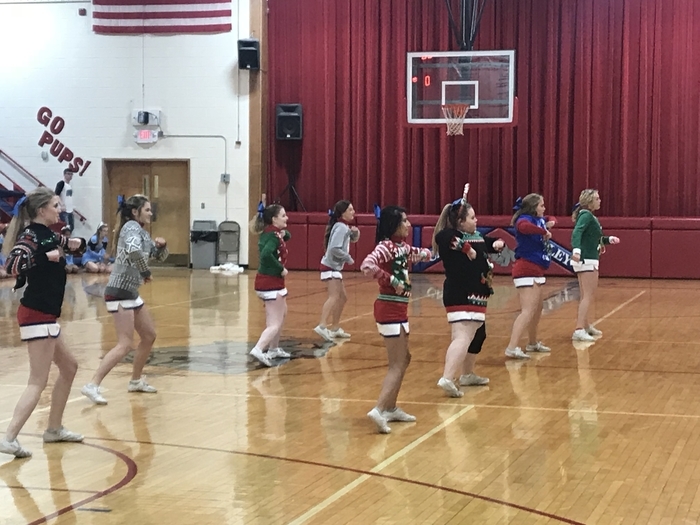 The Lincoln girl's who participated in the cheer clinic will NOT be performing tonight as the games have been rescheduled for Monday, February, 18th due to weather. They will perform at Monday nights game. If you have questions, please call us here in the office @ 620-879-9240. 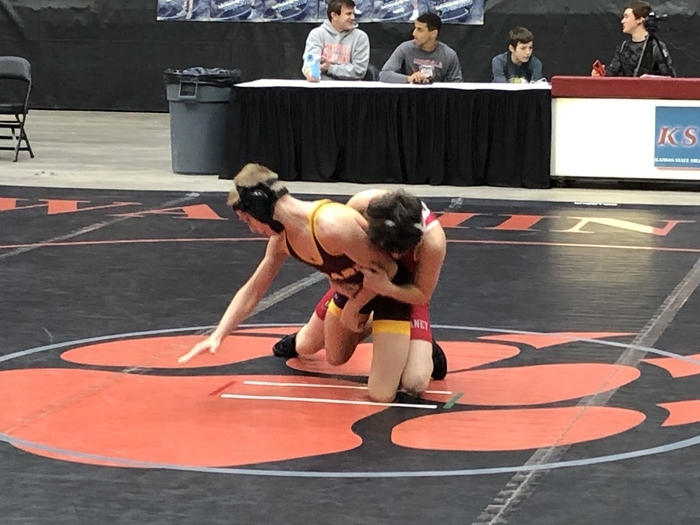 Nowata & TVL Wrestling have been cancelled and are unable to be rescheduled at this time. ACT test at ICC is postponed. Girls Wrestling & Band are good for tomorrow! Snowball is now from 6:00-9:00 PM. Pass the word & stay safe Bullpups! 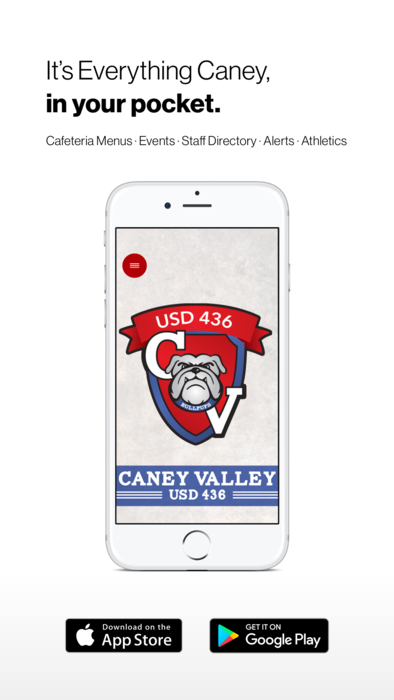 Remind everyone to download our school app! No School tomorrow, Thursday, February 7, 2019. With predicted ice accumulations and dangerous road conditions we want to give ample time for families to make arrangements for tomorrow. NO SCHOOL, Thursday 2-7-2019. Stay safe and warm Bullpups! Reminder: All band and choir pizza kit orders are due tomorrow, 2/7/19. This includes 6th grade band, both Jr. high and high school band, and high school choir. Roads look decently clear for the time being. There are some slick spots so please take precautions and as always make the best determination when driving to school. Conditions can always change so please pay close attention to social media and our website! Stay safe Bullpups! Don't forget to sign up, this is a great service for our students to be seen and screened! If you have questions you can reach out to our nurse Kristi Magee. Reminder: There will be a Lincoln Booster meeting today at 5:30 in the grade school cafeteria. 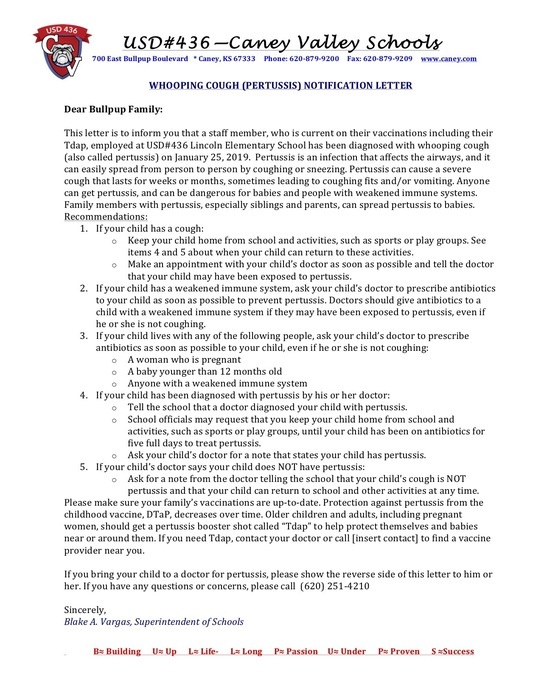 Please check our website and social media for important information regarding a confirmed Pertussis (Whooping Cough) Case. 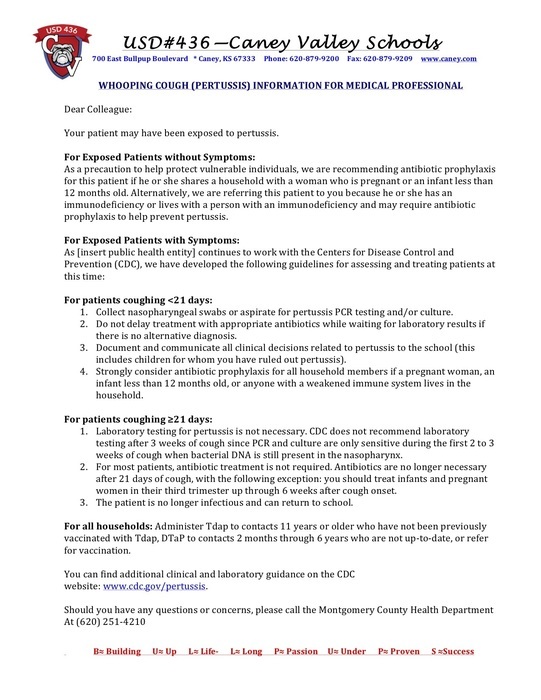 We are in contact with Montgomery County Heath Department and are taking precautions to limit further exposure. Please read the attached letter for info! 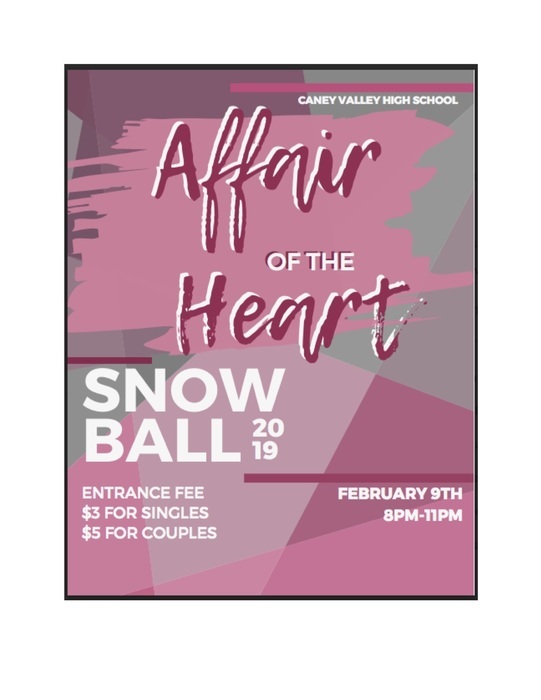 Mark your calendars for the 2019 Snowball dance - "Affair Of The Heart." Pups dominate Neodesha tonight - girls win 54-45 - boys win 82-45! 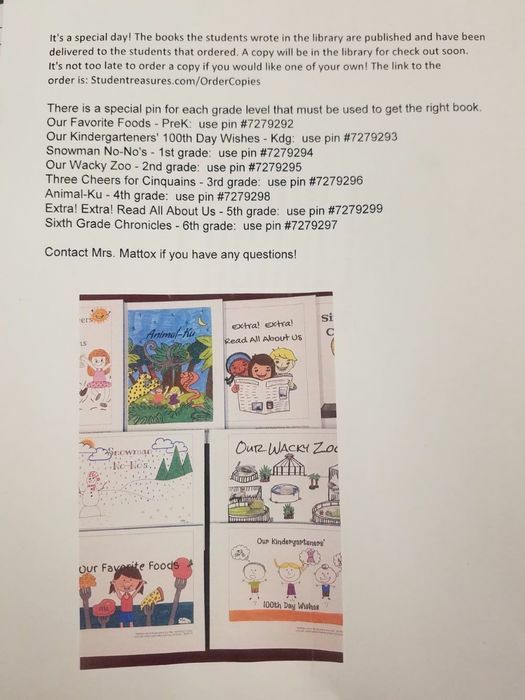 Congratulations to Malachi Thomas of Lincoln Memorial Elementary School. He won second place in the Montgomery County Spelling Bee today in Independence. Credit of photo and sponsorship to the Montgomery County Chronicle! The Reading Counts/Student of the Month assembly scheduled at Lincoln Elementary on Friday, January 25th will start at 2:35. Lincoln will be having a practice "Lock Out" drill today at 1:50. Phones will not be answered and no one will be allowed to enter or leave the building during the duration of the drill. Thank you for your cooperation! Reminder-No School tomorrow Monday, January 21st due to Teacher Inservice and Professional Development. The HS Basketball Tournament at Burlington has been changed to Tuesday, Thursday and Friday instead of Saturday. The finals will be on Friday. Check the events tab for details. 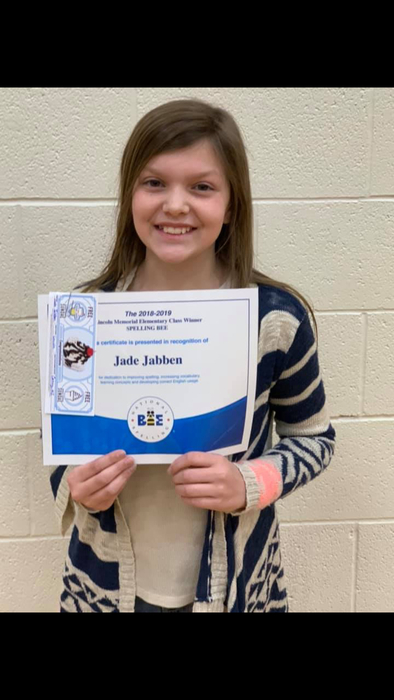 Jade Jabben got 1st place in the all-school spelling bee. She will continue on in the Montgomery County Spelling Bee in Indy at the end of the month. Congratulations Jade!! Tutoring for Lincoln will not resume until next Monday. 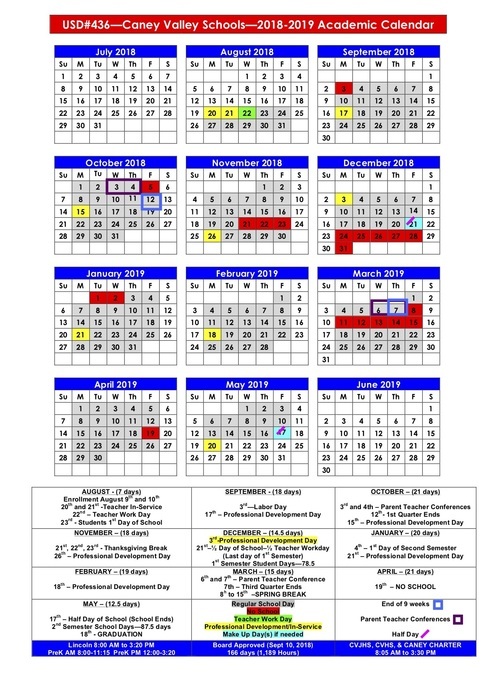 Reminder school is back in session, tomorrow, Thursday, January 3, 2019! Let’s have a great second semester BULLPUPS!! 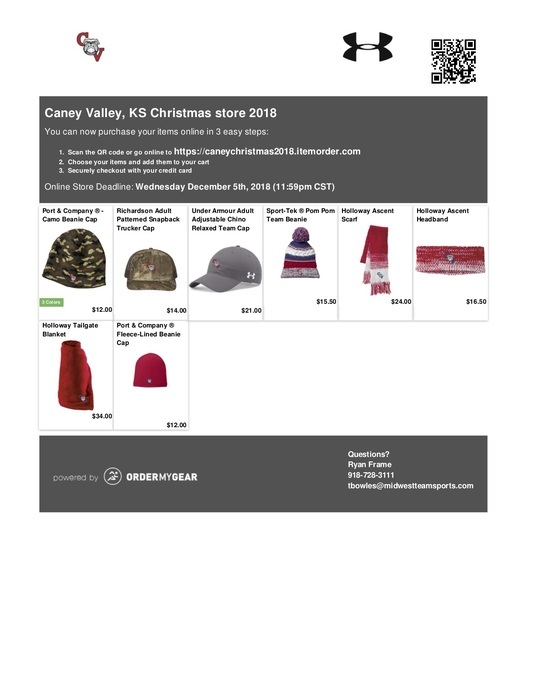 The online Christmas Store orders are in! You can pick them up at the board office until 4:00 PM today or from 7:30-3:00 PM tomorrow. If you need to arrange delivery, please call the board office at 620-879-9200 to arrange an alternative time to pick up. Senior Parents - Reminder that baby ad prices will go up on December 17. 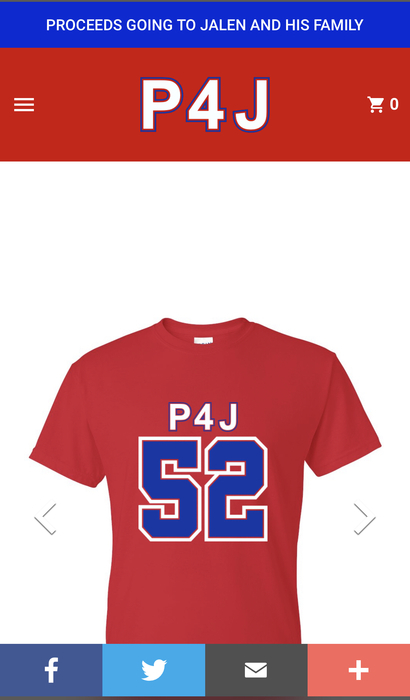 The ad information can be sent directly to Jostens online. Use the brochure we mailed to you for instructions. If you are not comfortable using online, you can send a photo, money, and saying to Mr. Nelson. 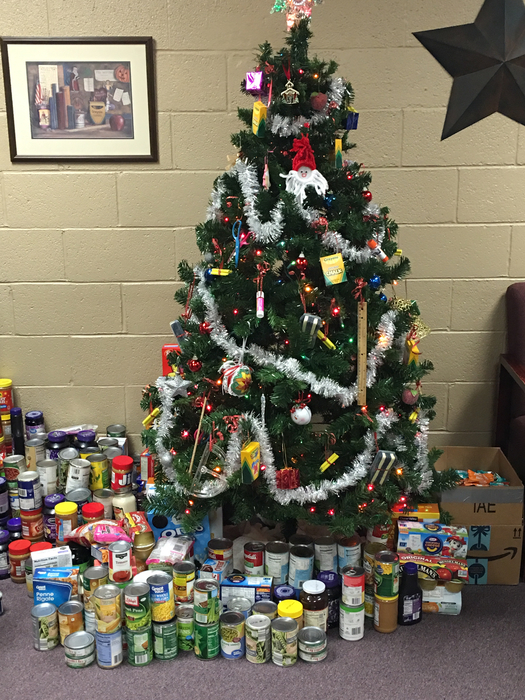 Thank you Lincoln Bullpups for your kindness and generosity in donating to the Food Pantry. Awesome job! 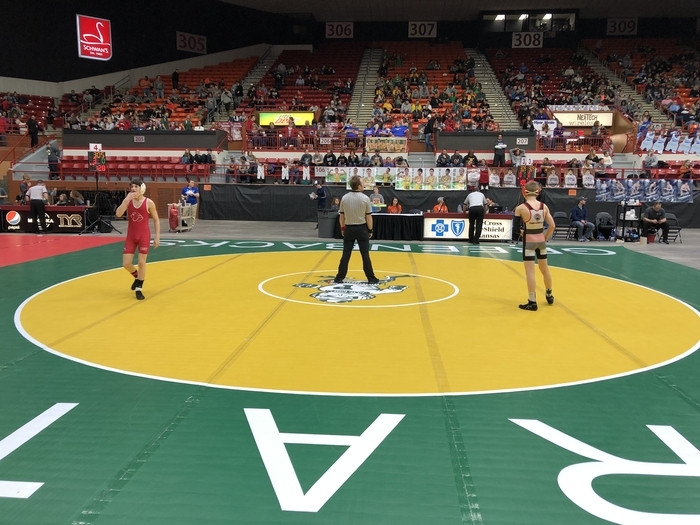 There has been a schedule change for the HS Varsity Wrestling for Friday, December 14th. 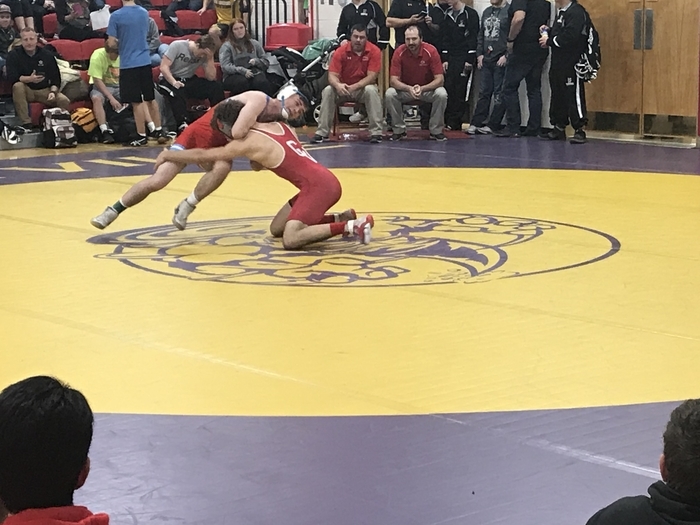 The wrestlers will be traveling to Miami, OK and the wrestling will begin at 11:00 a.m. This has been changed to a one day tournament. The High School is experiencing phone difficulties today and are working on the issue. If you need to communicate with the office, you can email at r_richey@caney.com or j_swindell@caney.com. 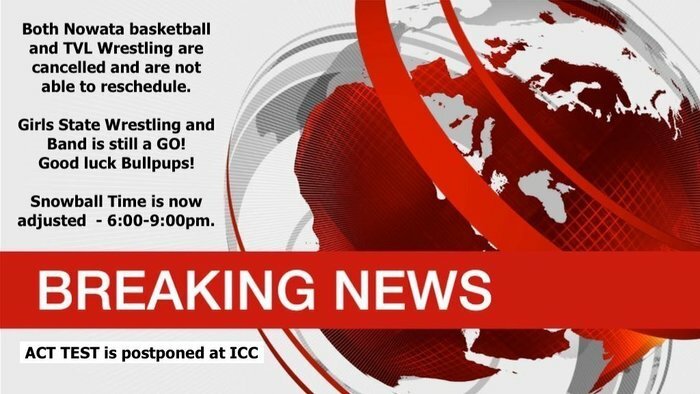 Sorry for the inconvenience. We are loving our new app! Access sports scores, cafeteria menus, news updates, and even emergency notifications, right from your pocket. Download the app on Android: http://bit.ly/2QdcbIw or iPhone: https://apple.co/2Q5oo25. No school Monday December 3rd, 2018-We are hosting the Southeast District FFA Speech, Creed, Food Science, and Agriculture Business, Career/Leadership Development Event! The High School basketball teams kick off their season tonight at Independence. 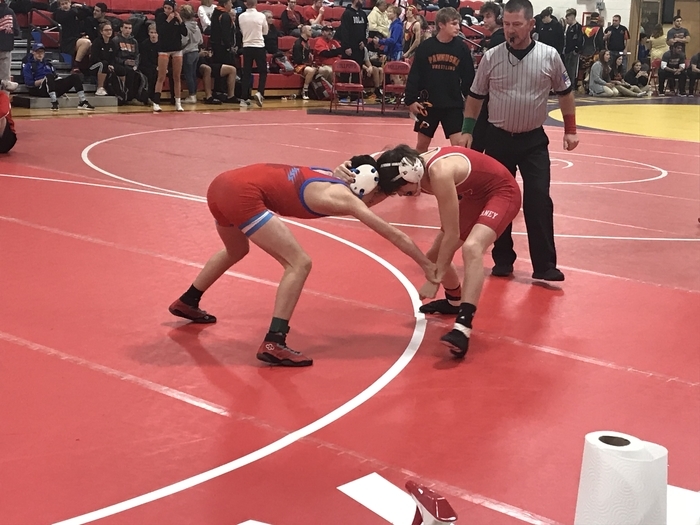 Tomorrow the High School Wrestlers will begin their season by hosting the 45th Annual Kan-Okla Wrestling Tournament here at the High School starting at 9:00 a.m. Be sure to come out and support our Caney Bullpups!!! 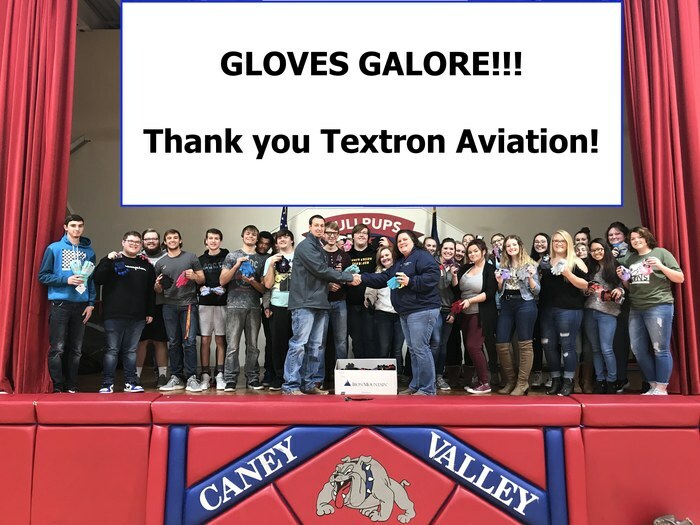 Thank you to Textron Aviation for all the gloves! 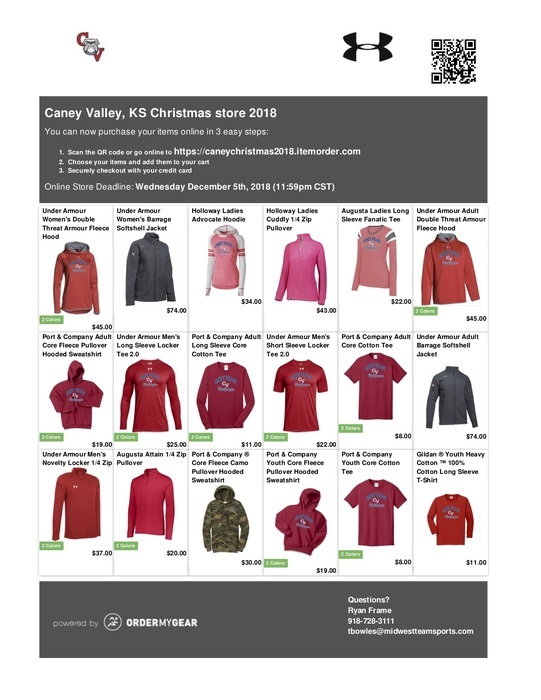 The Bullpup Family will be nice and warm this winter. Important Booster info! 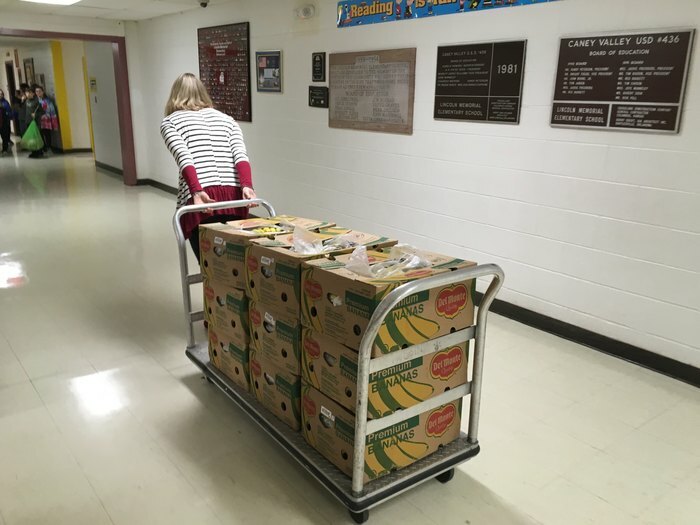 Friday Nov 16 will be pie pick up day from 3:20- 6pm in the grade school cafeteria. Lincoln Booster carnival is Saturday Nov 17 from 6-8pm. And the ice cream party for fundraiser participants is Monday Nov 19 from 3:20- 4:20 in the grade school gym. The party for the students who participated in the booster pie fundraiser will be Monday, Nov. 19th from 3:20 to 4:20 in the grade school gym. If you have any questions please call the office @ 620-879-9240. Thanks! Family Fitness Night will be tomorrow, November 13th from 6-7 in the grade school gym. Hope to see you there!! 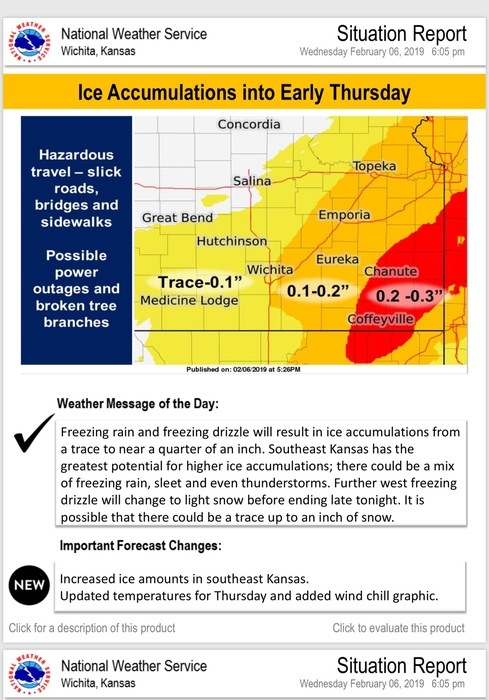 Remember to pay close attention to the district website, Facebook, Twitter, as well as for all call and text alerts regarding inclement weather. Please make the best decision when driving in the morning, leave extra time for travel, and take precautions. Stay Safe Bullpup Family! The ice cream party for the children who participated in the booster fundraiser will be held Monday, November 19 from 3:20 to 4:20 in the grade school gym! The Native American Student Association would like to invite everyone to the Indian Taco dinner tonight @ 6:00 in the High School cafeteria. The dinner is free but they will take monetary donations. Hope to see you there! There will be a Booster meeting Monday, Nov. 5th at 5:30 in the grade school cafeteria. Everyone is welcome to attend!! Winter Sports will begin soon. 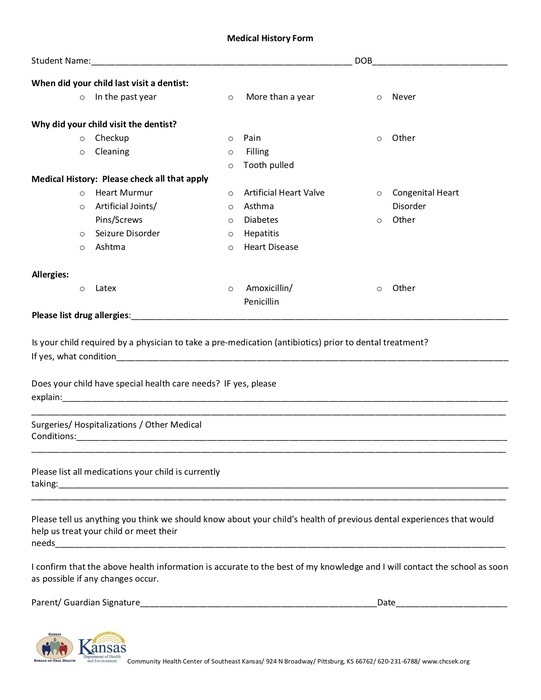 This is just a reminder that students must have a physical on file for this school year in order to participate. Physical forms are available in the main high school office as well as the athletic office. 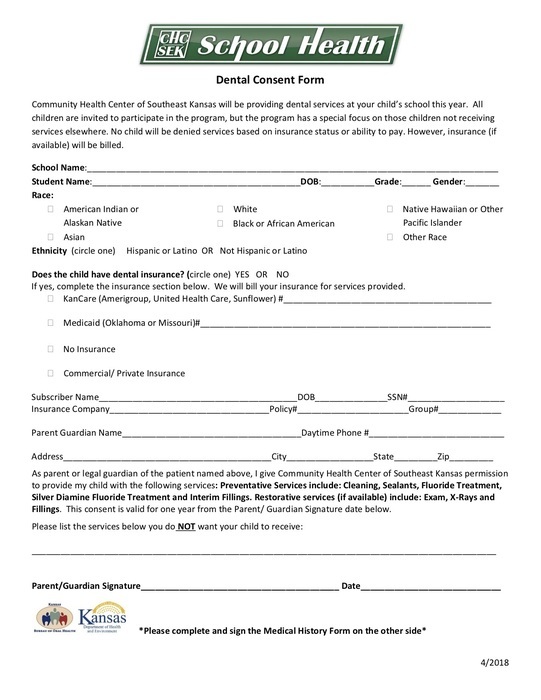 Be sure that all forms are signed by the student as well as the parent. Important times to keep in mind for the Halloween festivities at Lincoln Elementary! 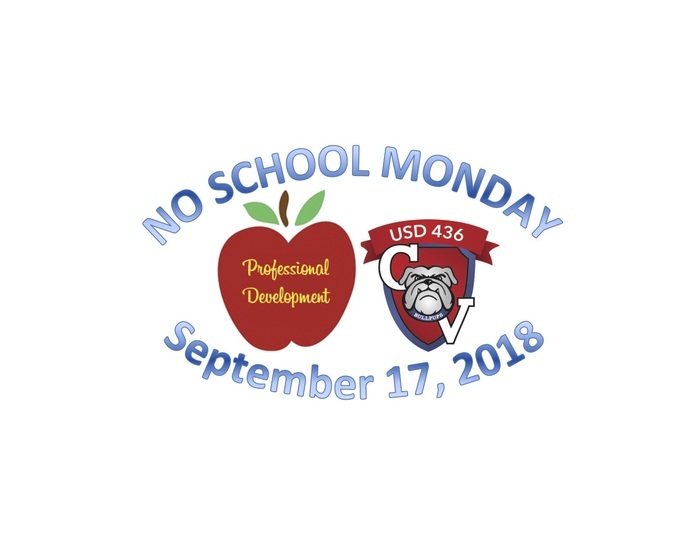 1:20 Parents may arrive to the school 1:50 Students leave the building 2:20 Parade begins 2:50 Classroom parties begin If you have any questions, please call the office @ 620-879-9240. School will be in session tomorrow October 29, 2018. We will have bottled water on site for students to drink. Have a great night Bullpups! 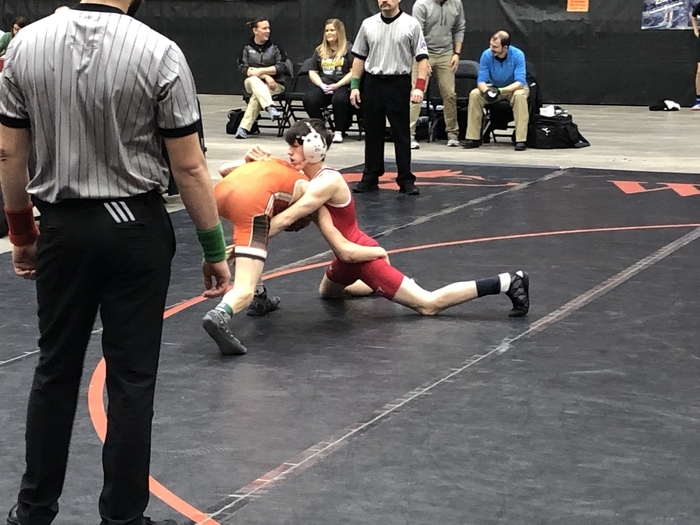 Junior High Wrestling Schedule 10/30 at Burlington - 3:30 11/5 at Fredonia - 4:00 11/8 at Cherryvale - 3:45 11/10 at Columbus - 8:00 am 11/13 at Independence - 3:30 11/17 at Coffeyville - 8:30 am Go Pups! We are bound for Prairie View next week! Great win tonight Bullpups. Let’s get healed up and go get a road win in the playoffs!! 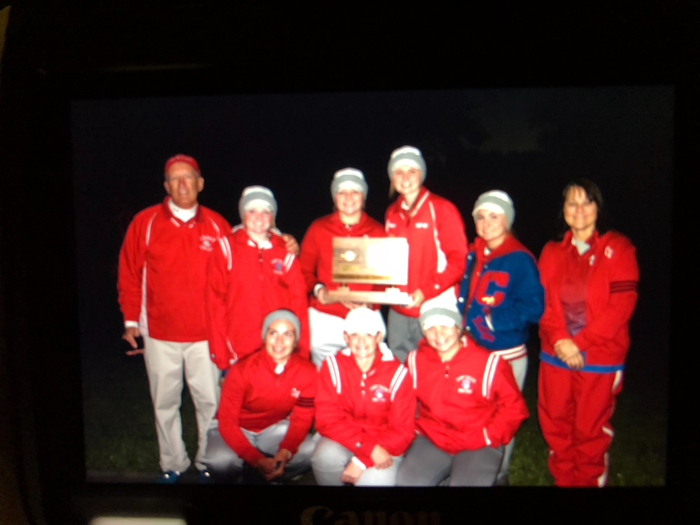 The CVHS girls golf team finished 3rd in the state with a 383! Individuals in the top 20, Hannah Hedges 8th with a 90, Liz Rogers 9th with a 91, and Bailey Price 15th with a 95. 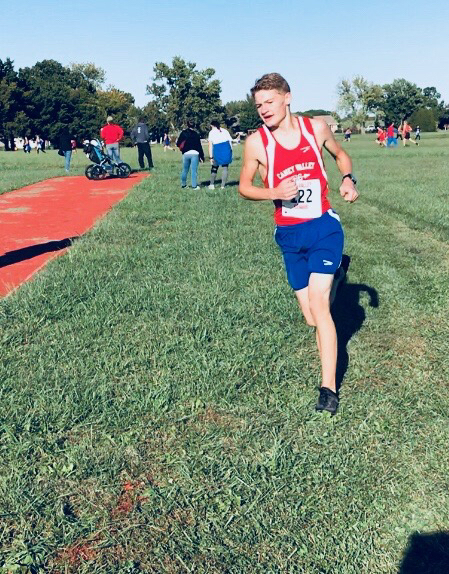 We have an individual boys CC league Champion, congrats Caleb on an amazing accomplishment! Our ladies took second in league, what a day BULLPUPS!! Please be sure to check our social media for an important message. Don't forget homecoming parade this evening starts at 8:00 and coronation is tomorrow at 6:00! Have a great evening Bullpups. 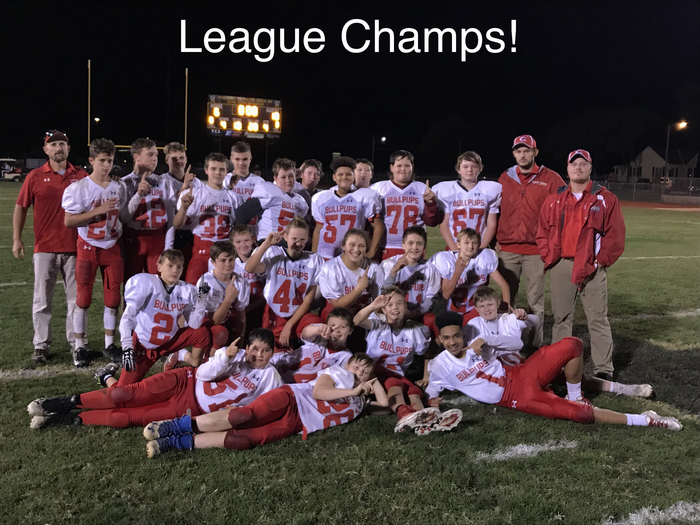 The JV Football game scheduled for Monday, Oct. 15th in Parsons will begin at 5:00 instead of 6:00 p.m.
Lady Pups are Regional Golf Champs for the 9th straight year! 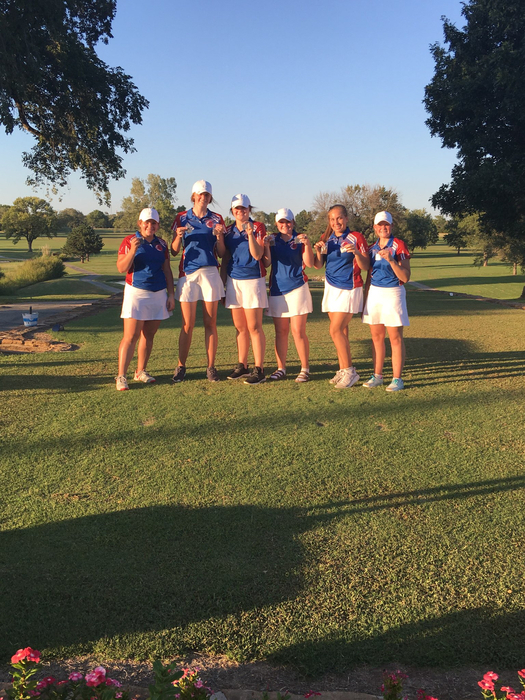 The girls shot a 383 on one of the toughest courses in southeast Kansas and won by a 69 stroke margin! Hannah placed 2nd, Liz 3rd, Bailey 4th, Lyndon 5th, Kalyn 7th and Kloie 17th. Five regional medalists! Next up, State at Emporia next Monday Go Pups! 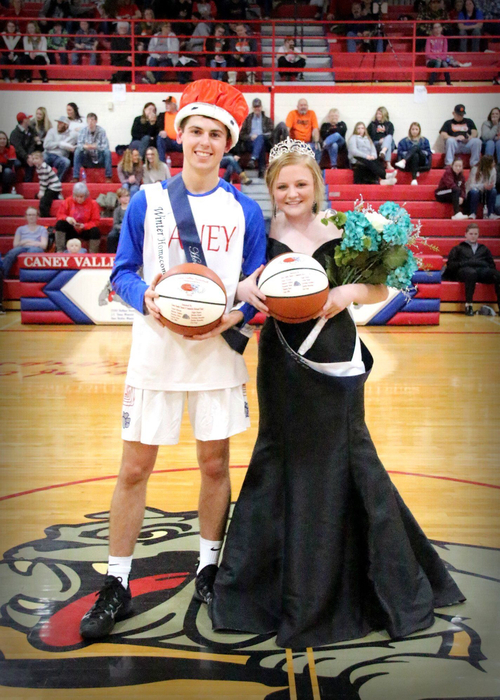 The JV Football game tonight here in Caney has been moved to the practice field or track east of the high school at 6:00 p.m.
Friday is homecoming and coronation will begin at 6:00 p.m. instead of 6:30 p.m. 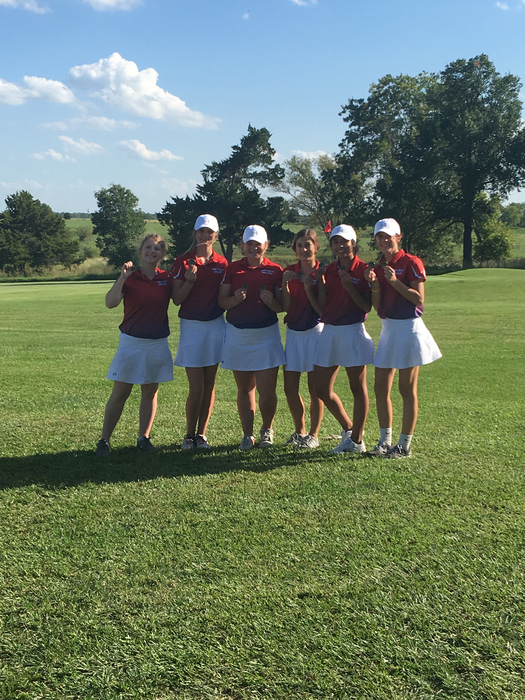 The CVHS lady golfers will be going for a 9th straight regional championship tomorrow at Pittsburg. Play will begin at noon. 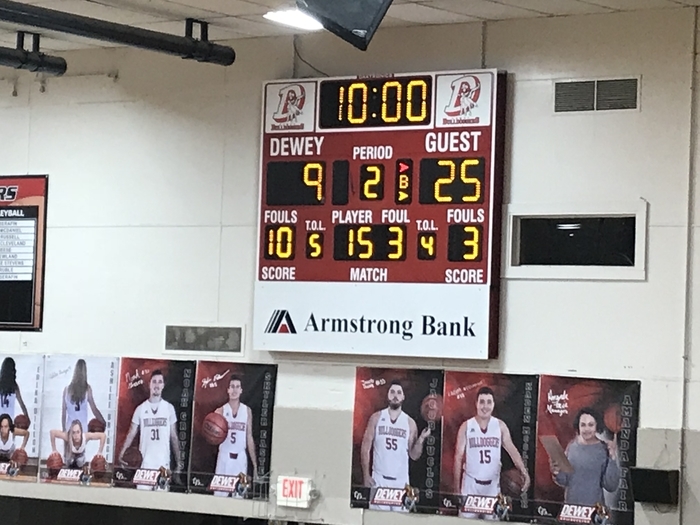 Scores will be posted on the KSHSAA web site. 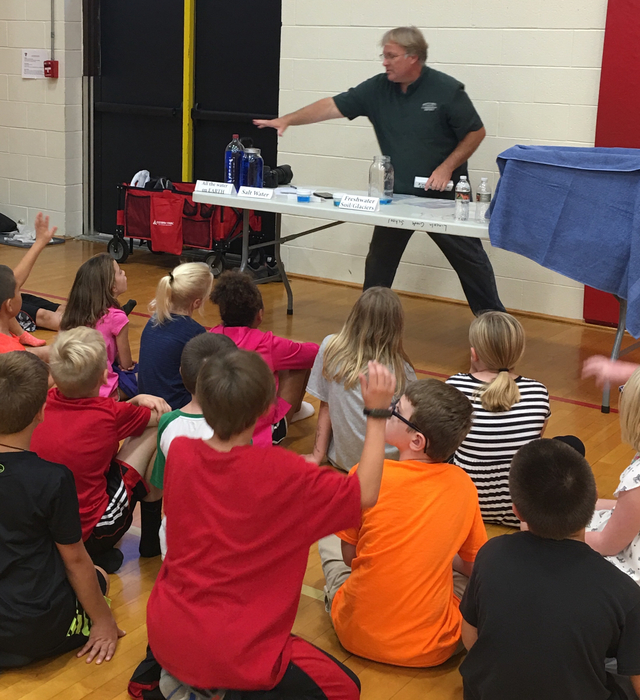 Robert Morgan from the Montgomery County Conservation District came to talk to 1st-3rd grade students about our world and the water around us. 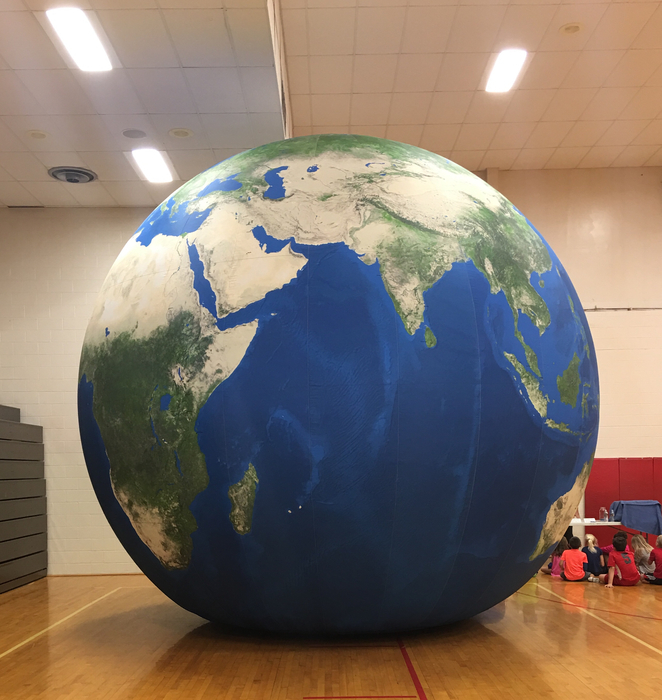 The students were able to get into the earth balloon to see the world from a different view. 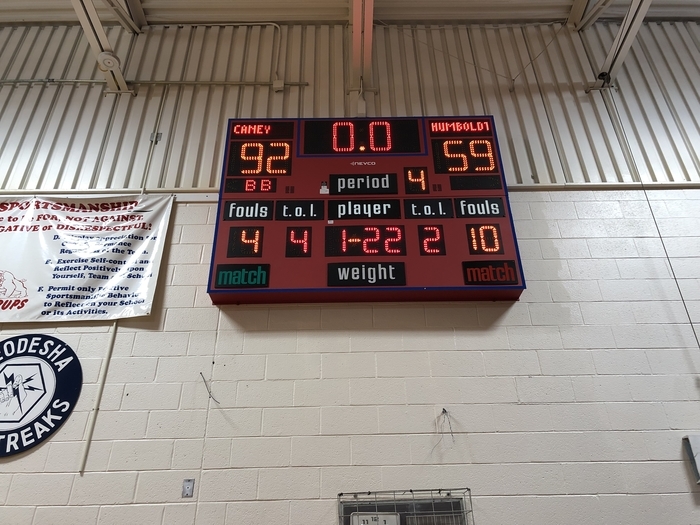 Tough fought game. It was a dogfight for sure! 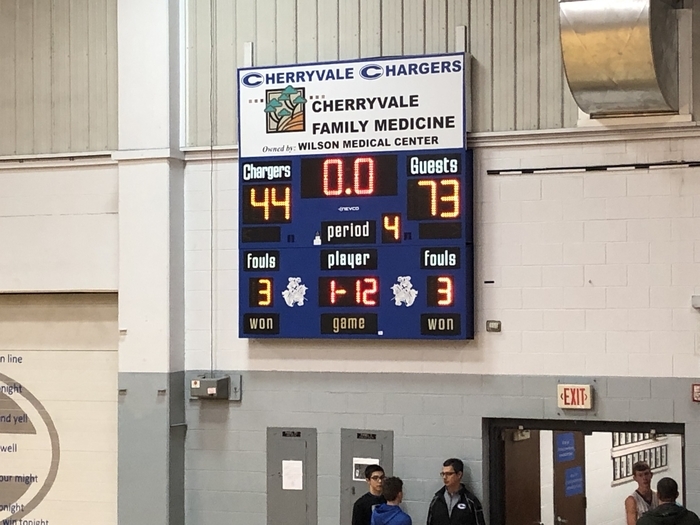 Proud of our Bullpups, they never quit, and I tip my hat to Galena for a well executed game plan. Time to regroup and come back stronger!! 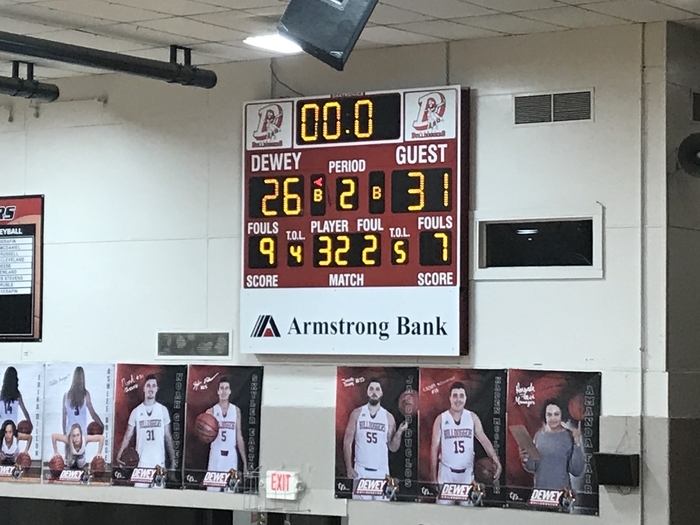 Big Night for the Bullpups here at home!!!! 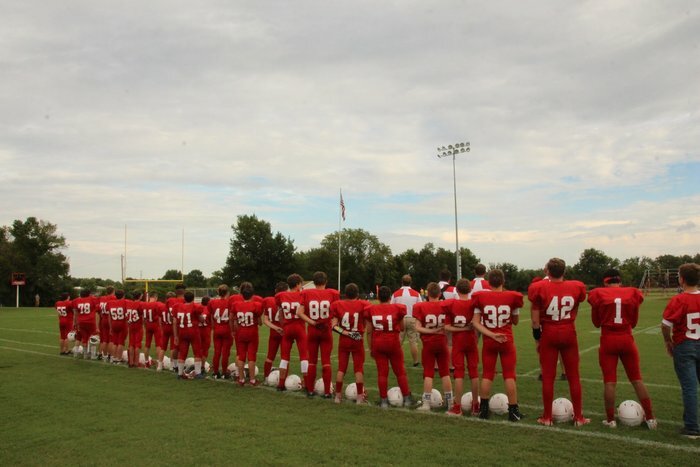 Varsity Football against Galena at 7 p.m. Hope everyone comes out to support the Pups!!! We’re still in session today! 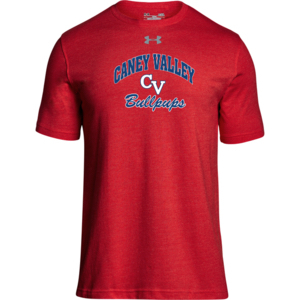 Some media outlets report Caney Valley out due to water, but that is Ramona, not us! Nothing can stop the battle of the undefeated tonight! Go Pups! 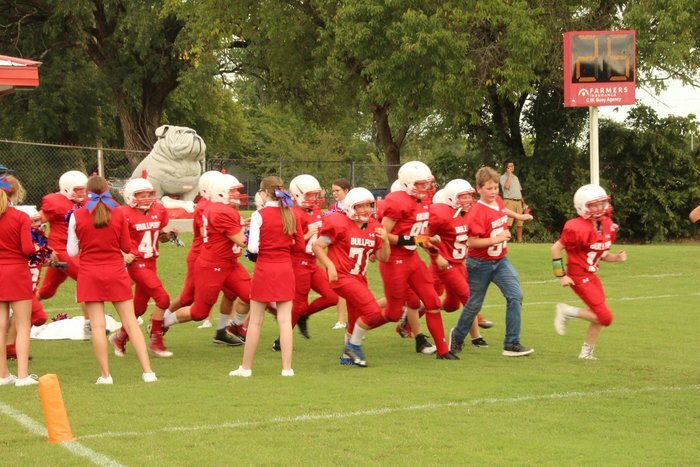 The Bullpup football team takes down Columbus 24-6! 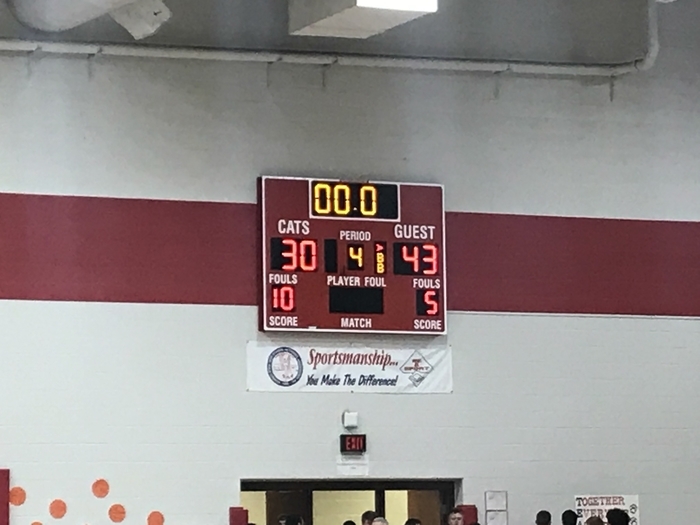 Big win for the Pups! 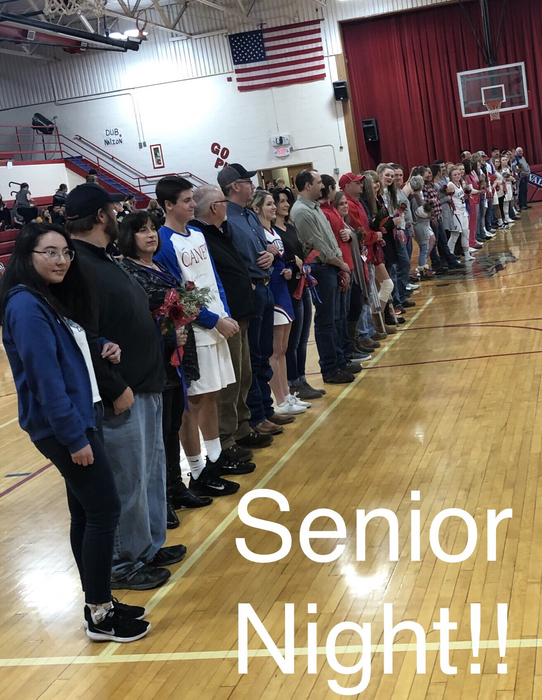 Lots of activities at CVHS today Girls Golf-Varsity will play at Fredonia 3 pm Volleyball -Varsity will be playing at Oswego at 4 pm HS Choir are at Winfield at the All-State Festival JH VB will play Neodesha here at home at 4:30 pm JH Football will play Neodesha here at home at 6 pm Come out and support your Caney Bullpups!!! The lady golfers JV squad earned a first place team finish at Erie. Ava Freisberg is tournament champion with a great score of 50. Taylor Gililand and Kimmy Salazar placed in the top 10. 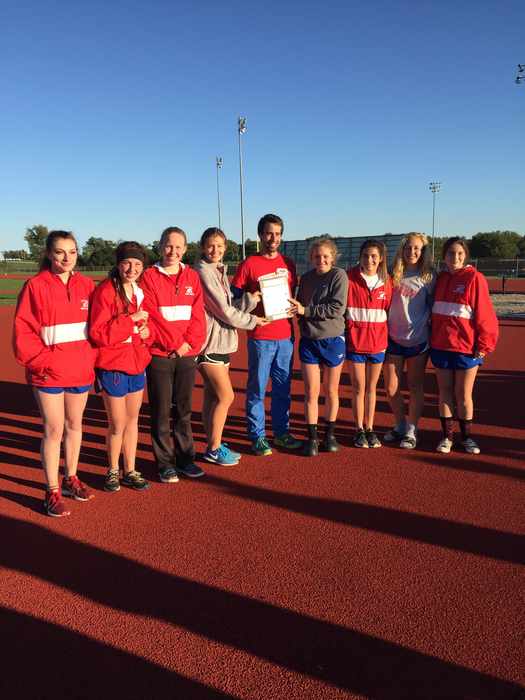 Other members of the winning team include Jillian Summers, Taylor Browning and Peyton Watts. 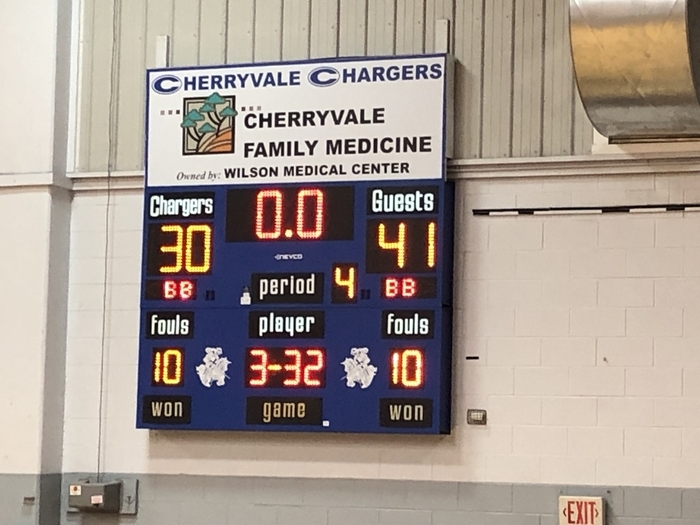 Way to go ladies! 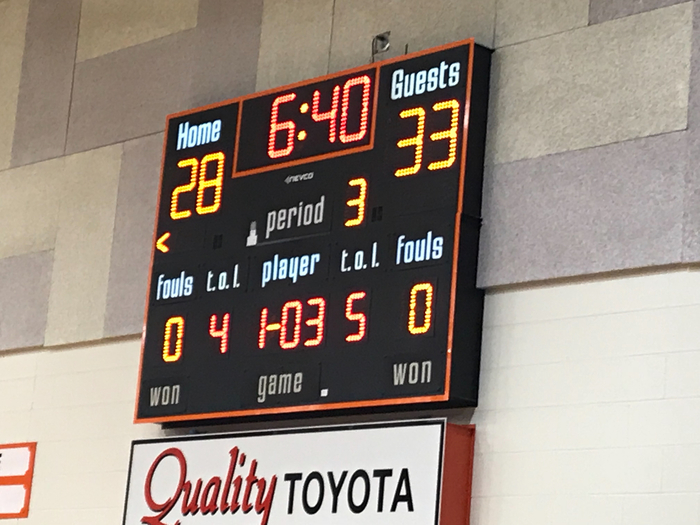 Junior High Pups win over Galesburg at Erie 22 - 8. Way to go pups! The JH Volleyball scheduled for tonight at Galesburg at 4:30 p.m. has been moved to Erie High School at 4:30 p.m. Headed to Erie! Another great day for golf. 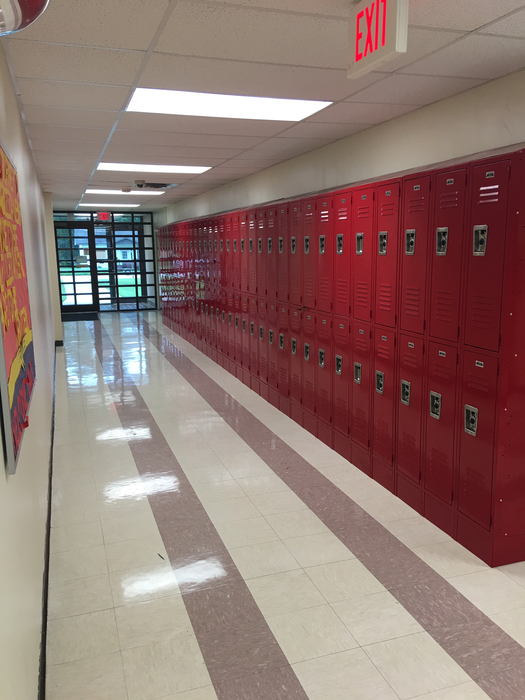 New lockers have been installed for the 5th and 6th graders at Lincoln. The students are loving them and they look great! Junior High Football! 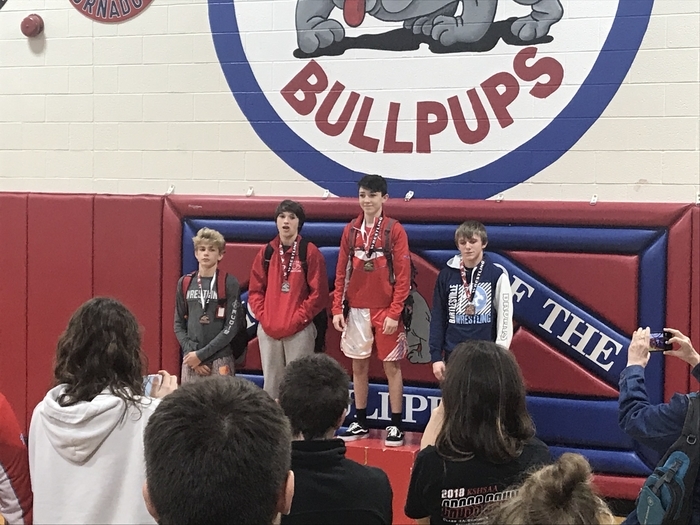 Great job Pups! 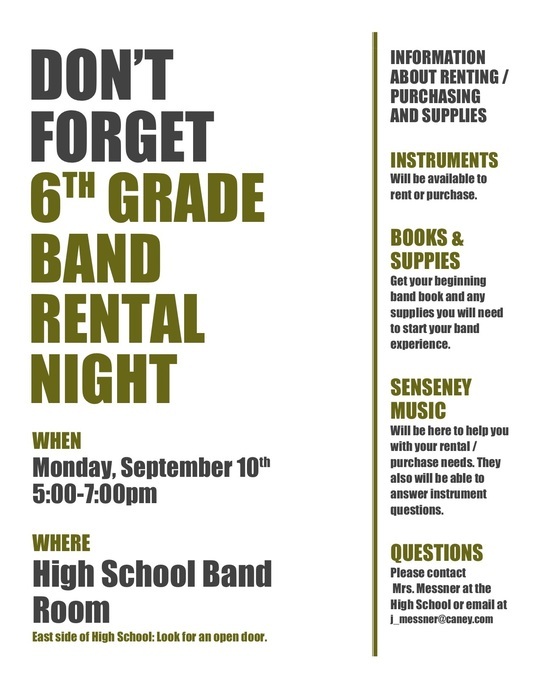 Reminder - 6th Grade Band Rental Night - September 10, from 5:00-7:00 PM, at the HS Band Room! No Power? No Problem! Great Educators always have a back up plan and turn issues into opportunities. Copyright © Caney Valley 436 2019. All rights reserved.